Eight scholars — four faculty members and four graduate students — traveled from the Catholic University of Eichstatt-Ingolstädt, Germany, to The Catholic University of America to speak at the first Eichstätt-Washington Seminar on Classical and Christian Culture earlier this spring. 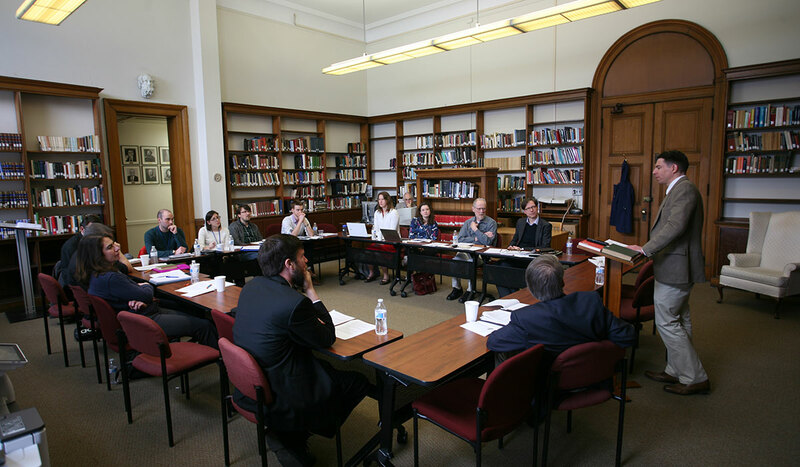 They were joined by faculty and graduate students from a variety of academic units at Catholic University for a week of papers, discussions, and informal gatherings March 19 through 23. The theme of the seminar was “Classical and Christian Education.” Participants discussed education in Greek, Latin, and Coptic texts, ranging from the mid-first millennium B.C. to the mid-first millennium A.D. The event was organized by the Center for the Study of Early Christianity and Department of Greek and Latin at Catholic University and the chairs of classical philology at the Catholic University of Eichstätt-Ingolstädt. Both institutions belong to the Catholic Consortium for International Higher Education Collaboration (CCIHEC), currently chaired by Mario Ortiz, associate provost for international affairs at Catholic University in D.C.